Fin Production is essential to any HVAC system. 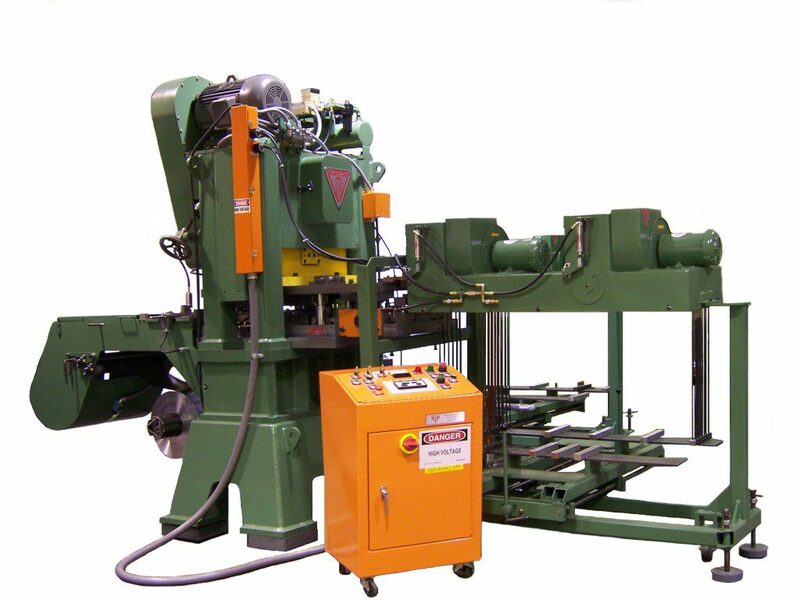 Michigan fin production companies use the industry-leading fin production machines from Tridan International. Fins can be responsible for up to 70% of the heat transfer process. At Tridan International we have an extensive selection of fin production machines to choose from. 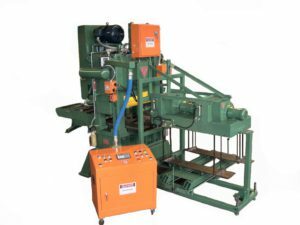 One of our popular fin press is the HFP75. This model is for high volume manufacturers. The HFP75 also has traditional mechanical press frame technology with a guiding system and user-friendly controls. Our Fin Collector VC-3WP is used for aluminum fins only. Also, this machine has a standard construction for a ribbon-type fin dies is a manually operated twin shuffle. 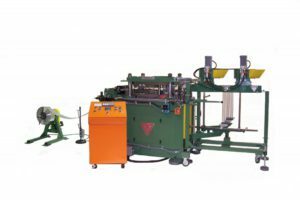 In addition, the complete fin collector and vacuum unit are built as a movable unit to facilitate fin die removal and installation at the front of the press. Also, it is mounted on heavy-duty rollers with the front rollers casters. In service, the unit bolts to the lower die shoe and the air and electrical connections are quick-connect. Along with these machines, Tridan offers medium volume and low volume machines as well. The medium volume models include VC-2RM, RDVS, and the fin press RLB45. Also, the low volume machines include FMTS, VC-2SM, FM-4 and the uncoiler FSU. Tridan has been supplying fin production machines to Michigan, Ohio, Indiana, Wisconsin and all of the Midwest. Along with dependable durable equipment, Tridan offers lubricants that you need for fin production. Lubricants such as evaporative lube, petroleum, and hydraulic oil TriLub. The TriLub hydraulic oils are designed to maintain system cleanliness and smooth functioning. In addition to lubricants, our parts and service department are always here to help with any troubles that may arrive. Finally, give us a call today at 217-443-3592 or contact us now to order your fin production machine. We deliver to Michigan and to all over the country! Fins are an important part of the heat transfer process with any coil. They also account for 70% of the heat transfer. A fin press and die should accomplish certain factors when stamping out a fin. The first a fin die does is it does not make all the edges straight. The reason for this, the leading edge is usually rippled so it can break up the air as it hits the fan. The second point is the fin is not flat. Also, it is designed to be corrugated to help the air bounce back and forth. The third factor, in the fin the tube diameter holes are punched through the fins to match the diameter and the number of tubes that may be connected. Finally, the fin collar is made when the tube hole is punched. When it comes to providing the HVAC industry with the proper fin and die press machines, the industry leader is Tridan International. We pride ourselves with top of the line customer satisfaction and stand by our products. Along with the fin production machines, we have an extensive line of accessories to make the job easier. Accessories such as die cart, stock dolly, and much more. Finally, contact Tridan today and see why we are the industry leader in fin production machines! Tridan International Inc. is one of the nation’s leading Fin Machine manufacturers. At Tridan International we have fin production machines for all types of work volume. In addition, we have machines that can handle low-volume production, medium-volume production, and high-volume production. With over 50 years of experience and customers in over 60 different countries, it is no wonder why Tridan is the industry standard in fin production machines. Also, our machines can handle any work load and models like the RLC75F can handle some of the biggest volume. The RLC75F Fin Press can provide maximum productivity with easy and quick setup. RLC line was introduced in 1971 and has been improved and refined over the years to make it one of the world’s best fin production presses. Also, Tridan’s tube fabrication, coil expansion, and fin production machines have a proven track record and are built to last for years of dependable operation. In today’s competitive environment, it is important to have machinery that has the strength to withstand the forces of daily production. Tridan is here to help coil manufacturers maintain a reliable ow of accurately produced parts, year after year. Furthermore, Tridan also prides itself in customer service. In the fin production industry, no other company comes close to Tridan’s dedicated customer service. Need service for your machine? No problem, simply fill out our service form and we will contact you about your machine. Finally, with a great reputation of service and excellent products, Tridan is the clear choice for fin production machines, contact us today or place your order for your next machine! What exactly is heat exchanger production? A plate-fin heat exchanger for example, is a heat exchanger that uses finned chambers and plates to transfer the heat between fluids. This type of heat exchanger is used in a variety of industries such as aerospace and cryogenics. Aluminum alloy fin heat exchangers have been used in the aircraft industries for decades. At its core, a heat exchanger is just a device that is used to transfer heat to different fluids. Some of our machinery for heat exchanger production includes the Fin Press – HFP75. This machine is designed for high volume manufactures of heat exchanger coils. The Fin Press-HFP75 is designed with features to improve productivity and little set up time.